Are Great Old Cities Dying? 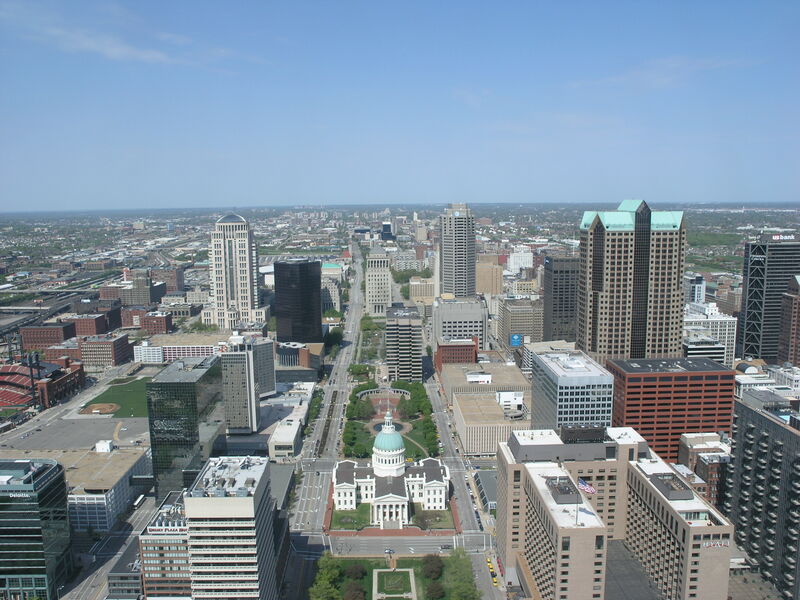 The image on the page is no doubt familiar to many–a view from the Jefferson Expansion Memorial arch (the Saarinen arch) in St. Louis, Missouri. I took the picture just a week ago, before tornadoes ripped through town, shutting down the airport and stranding many, including my family. We spent only a couple of days in the city before heading to the Ozarks for some R&R. On my previous visits I had many happy hours walking and driving around town in search of historic buildings and parks. For those who know where to look, there is rich history everywhere. St. Louis was truly a gateway city–not only to the west but to new technologies, manufacturing, aeronautics, architecture and engineering. Numerous 19th and 20th century marvels–the Eads bridge, Union Station, Louisiana Purchase Exposition, railroads, breweries– made St. Louis an exemplary urban experiment and a symbol of American innovation. In the center of the image is a small red box that played a key role in the development of the skyscraper–Louis Sullivan’s magnificent Wainright Building of 1891. Surrounded by its progeny, the structure now looks insignificant. In fact, much of the historic fabric of this once great city has been obliterated by the indifferent development of the past 30 years. My heart was heavy with disappointment last week as I saw the effects of the Great Recession on a town I’d come to admire and love. You see, St. Louis is a city with grand, generous civic heart. Like New Orleans in the Delta, this river town built an unforgettable culture symbolized by its public spaces, residential districts and institutional buildings during the 19th century. And, although pieces of each neighborhood, park, square and public building are still extant, the tawdry infill of sprawl and market rate commercial development has overwhelmed the city, leaving the good buildings stranded in a sea of mediocrity. Look at the little red box in the picture. You’ll see the same thing nearly everywhere, not only in St. Louis but in Milwaukee, Des Moines, and Kansas City. Though preservationists in the late 1970s brought back many neighborhoods and saved a district of 19th century commercial buildings downtown, discouraging tax laws and lax development controls in the intervening decades brought sensible urban conservation to a standstill, where it remains. The grand, big, generous heart that made St. Louis the pride of the upper Mississippi is still beating, but it can be heard only in small-scale, neighborhood initiatives, not in the spaces that make a city great. In my darker moments I look ahead to a time when the Federal government will sell billboard space on the stainless steel sides of the Saarinen arch–“This Bud’s for You,” St. Louis. At least the National Park Service will be able to pay its employees–and buy new anti-terrorist technology to keep visitors from being blown up while riding the tram to the top, where they’ll see a polluted river and an old city in decline. A century ago John Dewey introduced a radical idea in American education, then dominated by instruction in the “Three Rs.” At his Chicago Laboratory School, teachers gave elementary school pupils “the materials of life” and asked them to work with their hands to learn skills that their parents had practiced as farm hands and laborers. In a modern industrial society the idea seemed counter-intuitive–why bother with old fashioned hand tools when the machine would make such labor obsolete? Modern neuroscience has proved that learning through hand skills is fundamental to building the circuitry that young brains need to develop higher order reasoning. Moreover, society needs citizens who are capable of solving practical problems that require more than just a knowledge of Microsoft Windows. Children spend an increasing amount of their time in front of screens, meaning less and less exposure to the outdoors, to the pleasure of manual labor, and an increasing lack of practical knowledge that sustained previous generations. Faced with budget cuts, our public schools are giving up on courses in music, art, and hand skills–even basic auto mechanics and wood shop. It should come as no surprise that parents in some affluent areas of the country are trying to enrich their children’s education with programs that have fallen by the wayside in most schools. More surprising, perhaps, is the trend toward bringing what used to called “manual trades” education back into the lives of younger kids. The New York Times Home Section on Thursday featured an article, “Big Tools for Little Hands,” that documents this phenomenon. It appears that Dewey’s methods are re-entering the mainstream. I wrote a book on Gustav Stickley’s educational program at Craftsman Farms, and have written in this blog about hand craftsmanship. It makes sense to me that Americans, indeed most post-industrial citizens, are rediscovering the necessity of hand craftsmanship and so-called “manual” skills in education. I won’t go into all the reasons why this is so, but seeing children enraptured by making things out of wood at Construction Kids in Brooklyn fills my heart with joy. It is ironic that our society is dismantling an education system that was the envy of the world, while small groups of Americans rededicate their lives and careers to bring such wonderful experiences to the lives of young children. I am a believer that little things make a big difference. This is one seems to be doing just that. Hooray for hammers.